The battle between Coke and Pepsi in the 1970’s was all out war, even more than it is today in the politically correct times we now live in. Coke Cola always had the lead, and the battle was not normally in product, but in the battle of the advertising. Coke scored a huge goal in the early 1970’s with the global commercial called “I’d Like To Teach The World To Sing (In Perfect Harmony)”, the jingle became a song by the New Seekers, and the free global advertising continued for months. For me personally Pepsi had the edge, and I really cannot tell you why. Like Coke Cola it’s overall recipe is a secret, but whatever the difference in the products Pepsi had that refreshing edge for me. The early 1970’s commercials did well too, as you may recall trying at school to repeat the hugely long tag line at the end of every commercial. 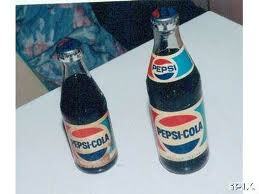 Pepsi was called Brads Drink up and till 1898, when it got the Pepsi name. In the 1970’s Pepsi scored another goal by having the blind challenge, which I remember doing in school for some reason. The results were, or appeared to show that people preferred Pepsi, and the commercials ran and ran. Job done.